Global demand for refining catalysts is forecast to grow 3.6 percent per year to $4.7 billion in 2020. This market includes catalysts used in fluid catalytic cracking, hydroprocessing, alkylation, reforming, and other catalytic applications. 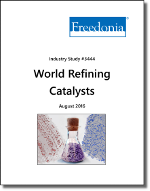 The refining catalyst markets in developed countries are mature, with strong competition among catalyst manufacturers. To maintain and expand market share in these countries, manufacturers invest significant time and resources into the development of catalysts that can function at higher temperatures and pressures, lower costs by increasing crude oil feed rate or catalyst life, and/or produce higher quality products. Companies mentioned include WR Grace, Albemarle, Royal Dutch Shell, Honeywell International, and BASF.